The 260-IRU-9400 Ultrasonic Snow Depth Sensors use ultrasonic technology to provide a non-contact method of detecting level of water or snow. Using the speed of sound, which is a well-known variable, the sensor calculates the distance to the object. The 260-IRU-9400 Ultrasonic Snow Depth Sensors use ultrasonic technology to provide a non-contact method of detecting level of water or snow. 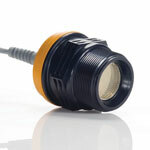 The ultrasonic sensor transmits pulsed waves of high frequency sound. If the sound wave meets a reflective object, such as liquid, it bounces back toward the sensor. The sensor records the time required for the sound wave to travel to the target and return. Using the speed of sound, which is a well-known variable, the sensor calculates the distance to the object. Until recently, the many factors that influence the speed of sound created inaccurate readings. Now with low cost microprocessor technology, many of these variables can be factored into the equation and eliminated. Temperature change is one such variable. The IRU-9000 sensors use internal temperature compensation to offset the effects of these changes. The IRU-9000 can also compensate for other variables, such as wave action, agitators, and humidity. Sensor adjustments are made via a computer USB interface using a programming module* and Windows™ compatible software. * The sensor is programmed before shipment. The programming module is not required, but can be purchased separately. The programming software is included with the module. The sensor is programmed before shipment. The programming module is not required, but can be purchased separately. The programming software is included with the module.